We all know David Byrne as the wildly animate singer of the Talking Heads, who’s carefree singing kept people talking about the Talking Heads long after the 80’s were over. But what some people may not know is that David Byrne has had one of the most prolific and varied careers long after the last Talking Heads record, Naked, was released in 1988. To give a brief background of Mr. Byrne – he was born in Dumbarton, Scotland in 1952. He moved to Canada when he was two, and by age five he had taught himself to play the accordion. At 9 his family had moved to Boston, and by the time he enrolled in high school he had picked up the guitar and violin as well. Andrew Bird, eat your heart out. But David Byrne is not only a passionate lover of music, he is as accomplished a visual artist as a sonic one. For a year, he took art classes at the Rhode Island School of Design (RISD) in Providence, and then dropped out due to the fact that he thought the classes weren’t worth the money. However, the school was invaluable to him in that it brought him together with Chris Frantz and Tina Weymouth who would form the Talking Heads with Jerry Harrison. During the band’s more than fifteen-year run from their first show in 1975 until they broke up in 1991, Byrne was extremely busy. Among other things, he directed all of the Talking Heads’ music videos, created the score for “The Catherine Wheel” a ballet choreographed by Twyla Tharp and formed the record label Luaka Bop – which highlights Brazilian pop artists. After the Talking Heads’ official break-up, David Byrne created a series of albums – many of them having Latin themes or even Spanish language lyrics. 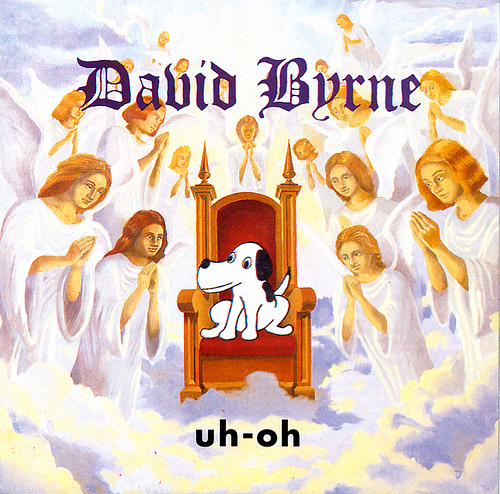 In 2002, he released the record Uh-Oh, the cover of which shows a choir of angels surrounding a cartoon dog seated on a heavenly throne. This track goes one to have one of the best instrumental breakdowns in any song that I have heard. Layer by layer, Byrne and his band build up the the sound – but what makes it so incredible is that the layers are made up of horns and woodwind instruments. In thirty seconds, he brings in two french horns, a flugelhorn, flute, clarinet and of course my personal favorite – the bass clarinet. But David Byrne has mellowed out a little but with his most recent record Everything That Happens Will Happen Today (2008). 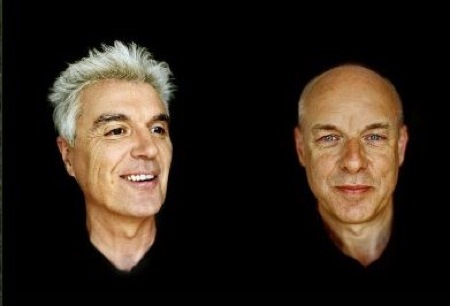 For the recording he teamed up again with British rocker Brian Eno, who played with the Talking Heads from 1978 to 1982. The album is more probing than anything else David Byrne has done since the Talking Heads and is fatalist in a Donnie Darko sort of way. You can listen to the whole album here. Ok, so more David Byrne to come in the next post! Including recent developments with N.A.S.A., the music group (not to be confused with the makers of the vomit comet) and Fatboy Slim’s band the BPA.